In 1989 when I became involved with Kenmare lace it had ceased to be produced in Kenmare. Only three nuns still knew how to make it. It was a very economically depressed time in Ireland. A local development association had been formed in Kenmare with a view to improving matters. After each lesson I would then teach what I had learned. The result of this was the development of a local co-operative. The aims of the co-operative were the revival of Kenmare Lace and the creation of a tourist attraction thus helping to create employment. This was a success and it wasn’t long before Kenmare Lace was once again being made and was for sale again in a shop we opened on the main street of Kenmare. Unfortunatly the co-op folded after 3 years. The bureaucracy was left behind I continued on my own with the lacemakers who had been part of the co-operative. The Kenmare Lace and Design Centre moved to the newly renovated Heritage Centre building. Here a small number of local women make the beautiful Kenmare lace once again. Our output is small, but we love what we do and we try to emulate the exquisit work of the Poor Clare nuns a century and more ago. At the centre we sell some Kenmare lace and also the other Irish laces. We do our best to pass on this wonderful art form through Winter classes and through daily demonstrations in the Summer months. We demonstrate not alone Kenmare lace, but also Irish Crochet Lace, Limerick, Bobbin and Carrickmacross Lace. 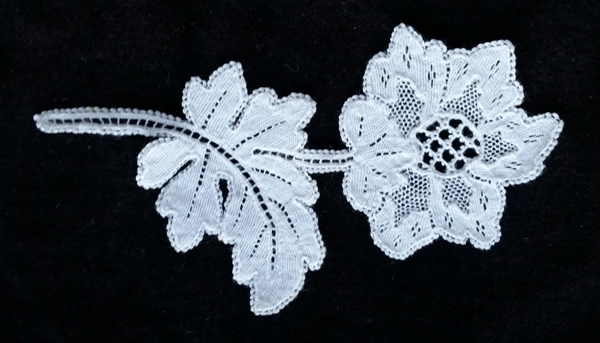 You can also see examples of Tatting and Mountmellick lace at the Kenmare Lace and Design Centre. Since the co-op folded 15 years ago Siobhan Thoma, her daughter Sinead , Rachel McLaren and of course Patricia Marsh have been unfailing in their continued support. Without the selfless backup of my children, Shane, Denis, Emer, Sandra and Niamh, the Kenmare Lace and Design Centre would not exist today. They each in turn as they grew up have manned the centre at the drop of a hat; as required, demonstrating lacemaking and passing on information on Kenmare Lace to tourists or anyone else who happened to pass the way. On the right are Sandra and Niamh. Sandra is making Limerick lace and Niamh is making Bobbin lace. To the bottom Emer is making Bobbin Lace for the then President, Mary McAleese on her visit for the opening of the Heritage centre. All of the girls make all forms of the lace and I am so proud that they all have embraced it as they have. The boys help out in other ways. Shane keeps us all on the straight and narrow and Denis and Sandra put this website together for me. Declan, my husband is always there to lend a hand when needed. The lace has been passed on from the “Poor Clare” family to my own now and I feel so privileged that I have been given the responsibility of carrying the torch and it is my hope that this beautiful industry will live on into the future.